The Ottawa Redblacks have...no, wait, sorry, minor typo, I'll try again. The Ottawa REDBLACKS have just traded a couple nobodies for a real somebody: wide receiver Maurice Price. Price finished last season with 34 receptions for 544 yards and two touchdowns despite playing in only 11 games due to injury. The 29-year-old from Charleston Southern had 109 receptions 1,737 yards and 12 touchdowns in his three years with the Stampeders. With the trade, we're saved of a good reason to cheer for Calgary: Third Edge of the Sword readers may remember Price being fined by the CFL for comments he made about fudge packing failed NFL prospect Michael Sam. 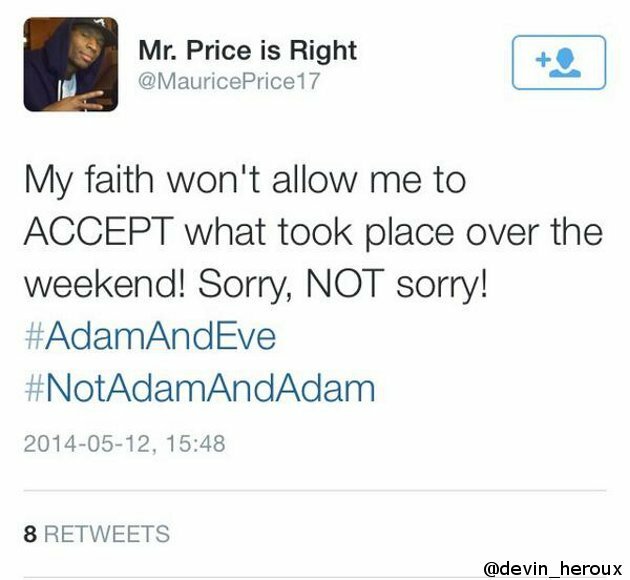 "The Calgary Stampeders are outraged by the offensive comments made today in tweets from Maurice Price's account. The comments are repugnant and in no way reflect the organization's views or values. The matter will now be dealt with internally." I guess now we know what the internal dealing with looked like: getting rid of Price (whose comment, which I 100% agree with) is included below. "I mean it's unacceptable," he said. "I mean this is almost 2015, so absolutely I will say something. And hopefully I will continue being able to say stuff." While he missed Week 20, Price recovered in time to practice during the bye week leading into the West Final clash with the Edmonton Eskimos, but, despite being listed on the roster as a starter, he was made inactive and watched the game from home. Even though many injured players stay away from McMahon Stadium during the regular-season, it did not sit well with some teammates that Price was a no-show for a huge playoff game. Hey, Maurice, we know you tried. But the (literally, now!) Godless Stamps went on to stomp us anyways (though the score makes it look more lopsided than 3/4 quarters really were and of course win Price a Grey Cup (where he played the first half and then got hurt).